Plot: Stanley Yelnat’s family has a history of bad luck going back generations, so he is not too surprised when a miscarriage of justice sends him to Camp Green Lake Juvenile Detention Centre. Nor is he very surprised when he is told that his daily labour at the camp is to dig a hole, five foot wide by five foot deep, and report anything that he finds in that hole. The warden claims that it is character building, but this is a lie and Stanley must dig up the truth. In this wonderfully inventive, compelling novel that is both serious and funny, Louis Sachar has created a masterpiece that will leave all readers amazed and delighted by the author’s narrative flair and brilliantly handled plot. You might be thinking, “so Simone, what were you thinking reading a book for 9-12 year olds?” Well, you tell me! Putting that thought aside, I can not remember the last time that I truly enjoyed reading a children’s book. My young friend Lauren recommended that I read the book first before seeing the tv-movie adaptation by Disney. We both like Shia LaBeouf and she thought it will be great to do a marathon of his films pre-Transformers. I am actually glad that I’ve read it, as I haven’t had such a breezy and wonderful time. The writing was flawless and the wonderful characters grabs you easily. I wish I had written it! 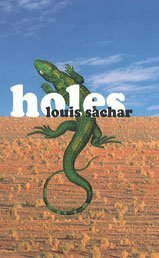 Holes which was published in 1998 also won Louis Sachar the National Book Award and the Newbery Medal. So do yourself or a younger sibling, nephew, niece, cousin a favor, tell them about Holes and you’ll be in their good books for a long time. Until of course you also tell them about the DVD which I am reviewing next.